Just as we are interested in the owners of a football team or a basketball team, I have always been curious about the who and how of a professional bike race. 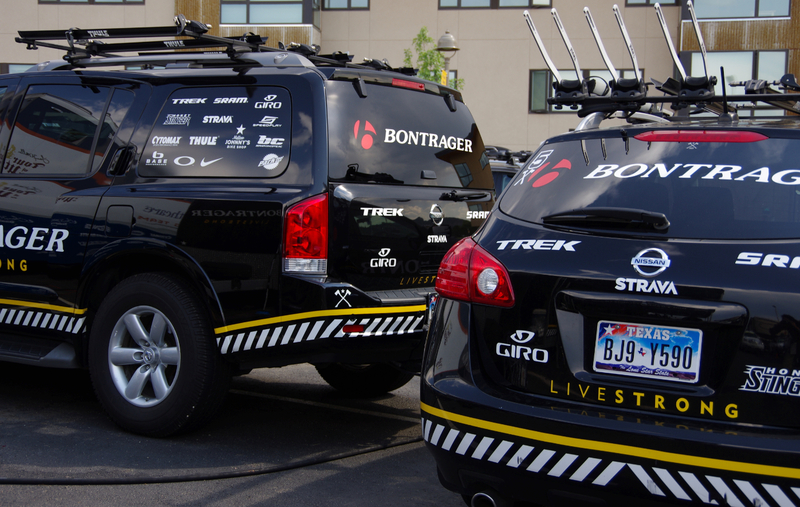 What does it take to put-on a race at the level of the USA Pro Challenge? I learned it takes a lot of money and a lot of people, but mostly two very dedicated Founders offering major financial backing. Yesterday I was happy to have a scheduled interview with Shawn Hunter, Co-Chairman and CEO of the USA Pro Challenge stage race, now in it's third year. He was open and welcomed my questions about the organization and funding of this race. As a fan of sport I am always curious about revenue-flow and who pays for what, but cycling has a different business model - the tickets are free to spectators. We might pay an enormous amount for our bikes, gear, and event or race registrations, but attending a pro race is absolutely free. The access that this sport affords the fan plus the free factor is something I never take for granted, yet I have been out on the road at a race and heard a spectator comment, "my tax dollars pay for this." I don't think so, I thought, but I wanted to know more. The USA Pro Challenge is 98% privately funded. 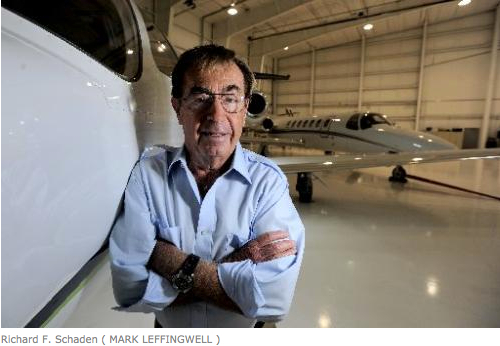 A 5-year business plan was drawn up in 2011 to support a race with a budget of over 10 million dollars annually. 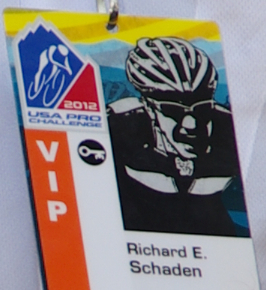 The USA Pro Challenge is privately owned and financed by Colorado businessmen Richard E. Schaden (Rick), and his father Richard F. Schaden (pronounced Shaw-den). As Founders, Rick Schaden and Richard Schaden are committed for the long-term of this race and plan to continue support for years. 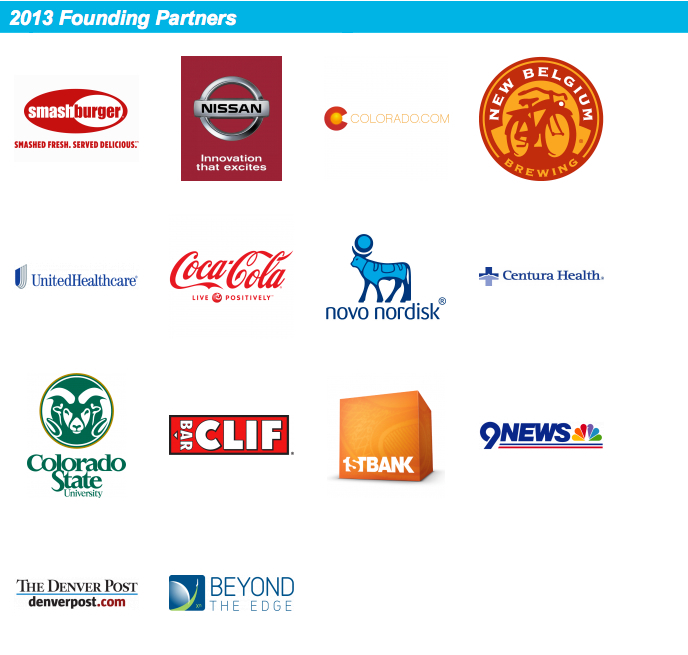 This is good news to cycling fans and professional cycling teams, who enjoy coming to Colorado to watch or race. 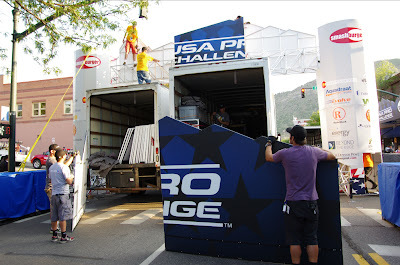 Mostly it is good news for Sponsors who want to put their products in front of spectators and for Colorado cities wanting to receive great exposure and great economic impact by hosting a stage of the USA Pro Challenge. 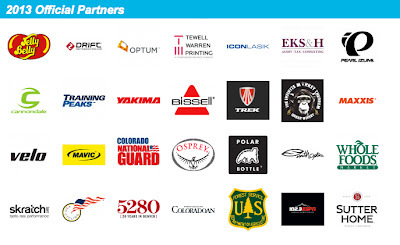 Sponsors and Host Cities receive international TV exposure in addition to an influx of consumers or visitors both during the race and after the race. 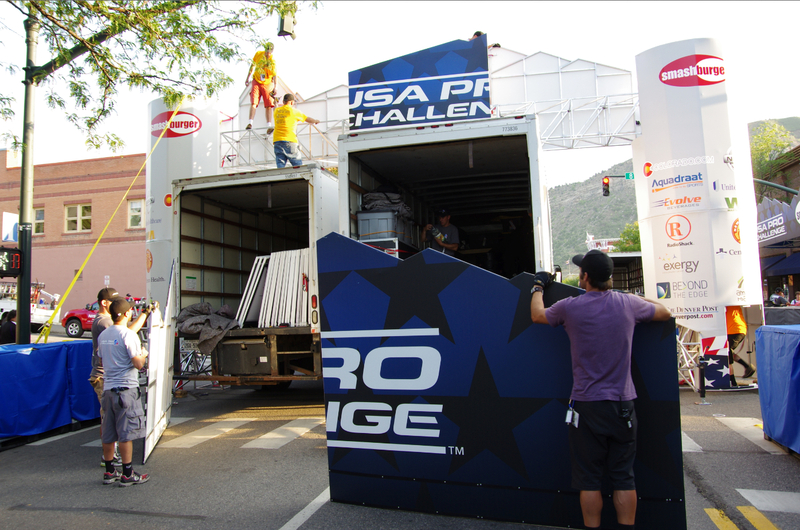 Over 4000 people support the USA Pro Challenge race providing continuity in quality - stage to stage and year to year. Over 700 rooms a night are needed to house the huge contingency that bring this race to life. Classic Bicycle Racing LLC was formed to run the race, based in Denver, Colorado, Shawn Hunter works along with approximately 10 other employees to plan and coordinate all aspects of the USA Pro Challenge. Medalist Sports, based in Peachtree City, Georgia, is the contracted sports management company taking care of all race logistics. 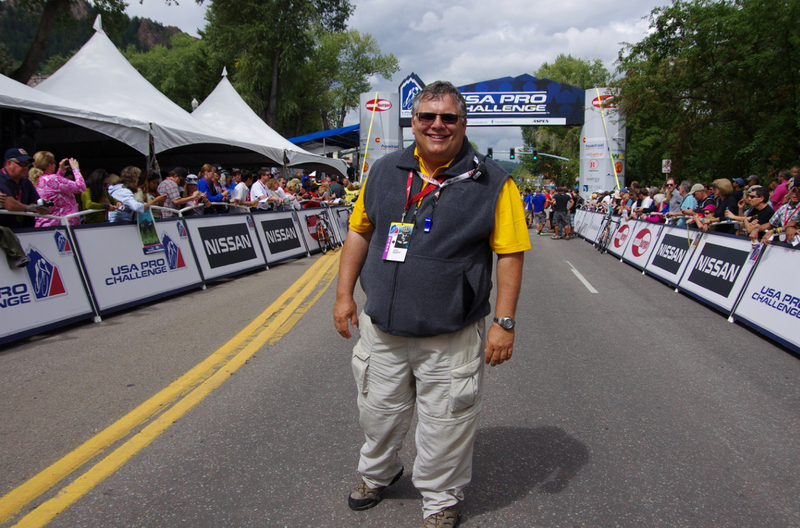 A huge job for Race Director Jim Birrell who works with approximately 13 other employees to coordinate the USA Pro Challenge, Amgen Tour of California, USA Cycling Professional Championships, Larry H. Miler Tour of Utah, and The Dempsey Challenge. Rogers & Cowan, based in Los Angeles with offices in New York and London, is the contracted public relations firm for the race. 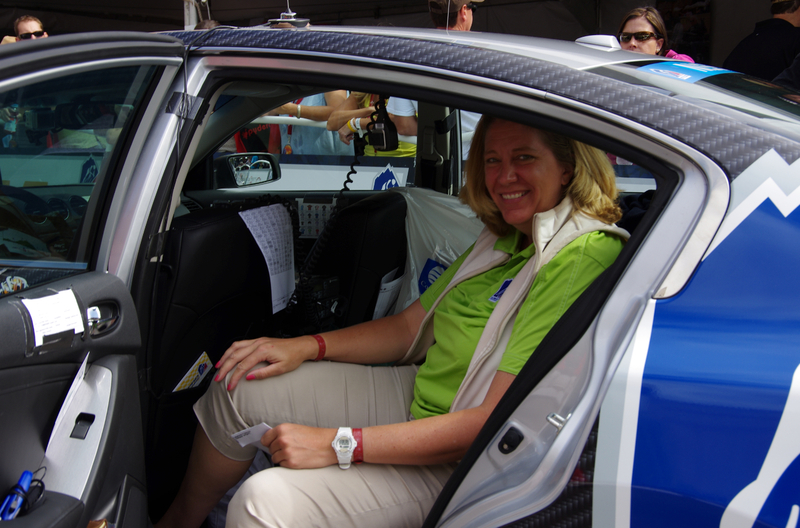 Director Nicole Okoneski keeps very active for months pre-race and during each stage. King of the Mountain (KOM) Sports Marketing, based in Colorado Springs, Colorado, is contracted to handle marketing and press relations during the race. Steve Brunner (above) is the Operations Director, and Guillermo Rojas (below) is the Field Operations Director, they have approximately 6 other employees, but mostly it is Steve and Guillermo who can be seen everywhere at this race. I am pretty certain neither of them get much sleep during the tour. I also have other race time favorites, those people I look forward to seeing twice a year in California and Colorado: Louise who works with KOM and manages the Press Room is beyond gracious; Terry and Steve who drive the Media cars are always friendly; there are a few Official Race Marshals that I get to regularly see in action including Ed Daily a supervising Regulator, one of the many hard working moto marshals (who track and keep the rolling poloton safe), and Larry Espinoza - no one gets by Larry. I believe this is the women that calls the race on the race radio for all the teams. I understand she speaks 4 languages and does an incredible job. The entire motorcycle support crew and official car crews are fantastic and come from across the United States to converge on the races organized by Medalist Sports. 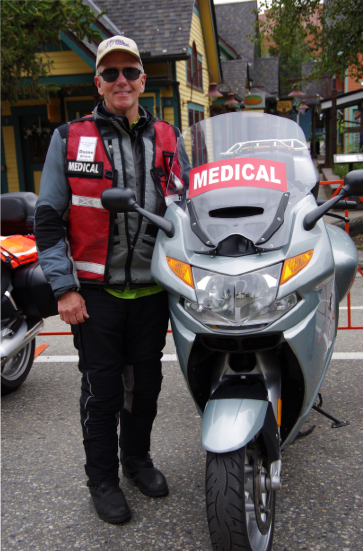 Some of the motorcycles used by race marshals, medical personnel, or drivers of camera crews or photographers are owned by the drivers and driven across country to the race, others are rented locally. Their expenses are paid for by Race Organizers. Many of the full-time race volunteers are repeat visitors, they too live in different cities, often taking vacation, others are retired. They put their name on a list awhile ago and are called when a race comes up to see if they are available. They travel in vans together, staying in hotels together, before being dropped at their varying assigned posts, stage after stage for the entire week. It has reached the point where I enjoy seeing the people behind the race as much as I enjoy seeing the riders. Especially some of the other members of the media. Local volunteers are fantastic, thousands volunteered to help in 2012. Without the valued volunteer this race would be impossible. 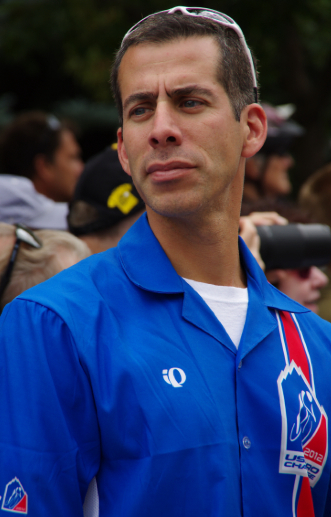 Shawn Hunter explained, "They come because of their passion for the sport or to support their community." They come donating their time and boundless energy, and in the end contribute immensely by making the day at the race a good experience for everyone involved. 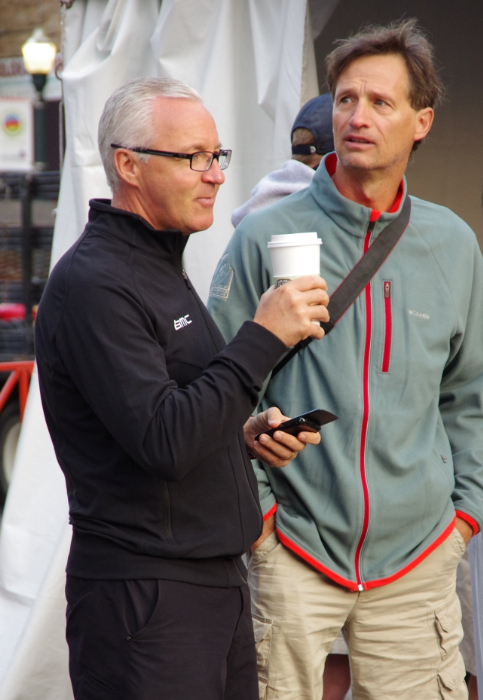 When a city bids to host a stage of the USA Pro Challenge, they agree to provide certain public support including some local police, local city road closure, and waste management. The majority of the cost to insure safety of the spectators and racers, or the "Lion's Share" to use the exact words of Shawn Hunter, falls on Race Organizers. 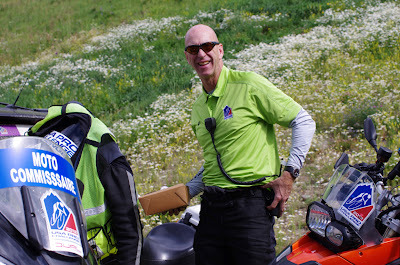 The Race pays for nearly everything it takes to put on this great event except for the manpower of local volunteers and perhaps the Mavic Support crew and the majority of media. Host cities also provide public space and utilities, coordinate local volunteer efforts, create special events to attract spectators, provide local transportation, publicize and market the event and welcome visitors from around the globe into their hometown. It is their day (or two) to shine as a community. Cities are in the business of doing this to promote local commerce. Shawn Hunter refers to the Host Cities as "Partners." 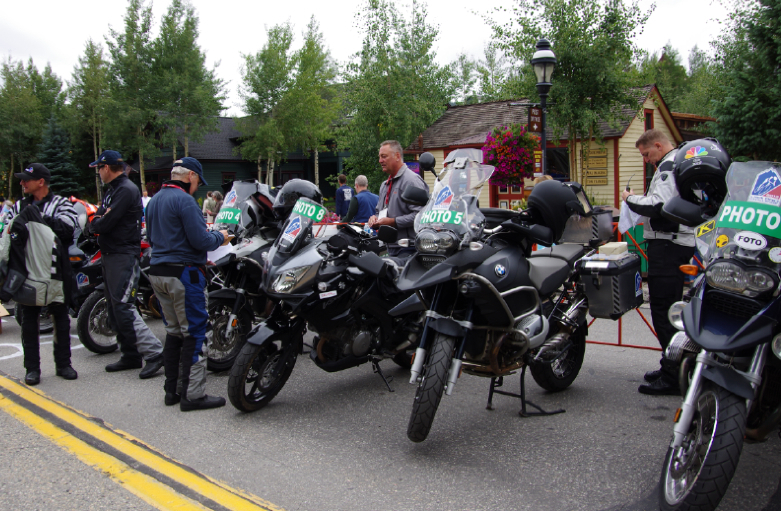 The 2013 Host Cities are: Aspen, Snowmass, Breckenridge, Steamboat Springs, Beaver Creek, Vail, Loveland, Fort Collins, and Denver. What comes in, what goes out: The Partners, both Sponsors and Host Cities, pay varying amounts depending on exclusivity and impact. Contracted Companies for Logistics, Marketing, Press and Public Relations. Full press room facility with complete business equipment and food for hundreds. Tents, fencing, staging, loudspeakers, road safety equipment, generators, tanks, portable toilets, crowd safety equipment and event equipment. 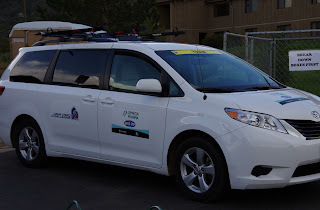 Shawn Hunter explained to me that covering the costs of road closures along the route varies between the local cities and the USA Pro Challenge. Road repair is not something the Race Organizers get into, (as we all know from the Tour de France - local cities in France are required to complete road maintenance on all local roads prior to the Tour arriving). Shawn Hunter said they select their routes based on existing good conditions of roads in Colorado. 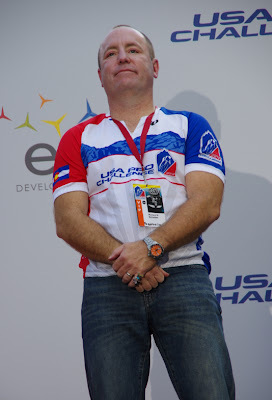 I was personally most surprised that the Race Organizers pay for all team expenses associated with getting the team to the race and being at the race, but Shawn Hunter explained that it is part and parcel of being a 2.HC UCI level stage race (one of only 2 in North America). Team expenses alone are huge with riders coming from all over the world, 7-10 nights of hotels, transportation, 16 teams, 8 riders on each team, management, coaches, mechanics, soigneurs, cooks, masseuse, support staff, bus drivers, and a lot of hungry riders! 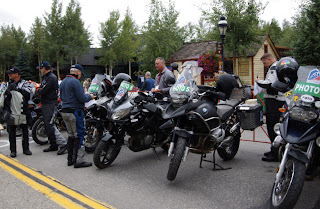 Team Equipment: the bikes belong to the teams or sometimes to the individual riders. 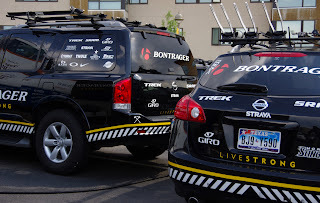 Some pro teams bring their own team buses and team cars, other teams rent vehicles using the Race Organizations rental car company and place temporary decal stickers on the cars or RVs. Last year Team Omega Pharma-Quickstep had a lucky volunteer RV driver from Durango who stayed with them the entire tour. Even more reason why you should sign up as a volunteer - you never know what you could be doing. Even with funding of ten million dollars annually, the race looses more than that every year and will continue to do so "for a couple more years," Shawn Hunter explained to me yesterday. This is as planned and they are in it for the long run he assured me. The least we can do as fans is GO! Go see the race with your family or friends. Ride your bikes - and multi-task, get your exercise in while being entertained - it's FREE to watch the race! Try to give back to the host cities who are using some of their resources to further promote their town and it's local business owners. Your tax dollar is paying for a very miniscule amount of this bike race, and most likely only if you live in one of the towns. According to the USA Pro Challenge published information on the Race Founder - "Rick Schaden is Founder and Chairman of Consumer Concept Partners, and is actively involved in building the firm into a nationally recognized private investment, concept development, strategic advisory and causal marketing firm. 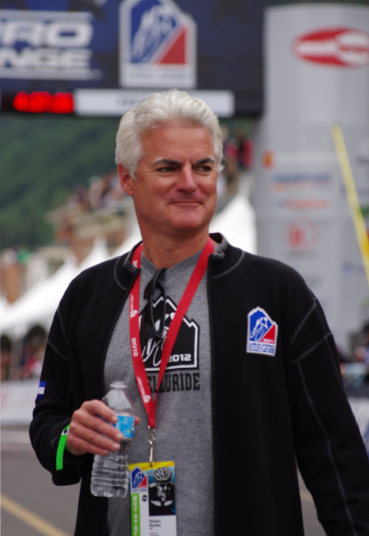 As founder and owner of the USA Pro Challenge, Rick led the vision of the race and established it as an internationally recognized and respected brand. With the financial support of his investment group Consumer Capital Partners, Schaden saw the opportunity to further the growth of the sport and create longevity in the international sports arena. Rick’s philanthropic interests concentrate on homelessness via America’s Road Home and helping young adults discover their talents and value through Smart-Girl." If you see Rick and Richard at the race in August - go up and say a hello and Thank you! Chances are they will look like every other fan out enjoying a good competitive bike race and a nice day outdoors in Colorado.